Magellan was a NASA Venus radar mapping mission, named after the explorer Fernao de Magalhaes (1480-1521). Magellan surveyed almost the entire surface at high resolution and enabled a global gravity map to be compiled. Its extended mission ended on October 13, 1994, following an aerobraking experiment which (intentionally) caused entry into the Venusian atmosphere. 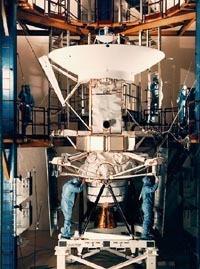 The primary objectives of the Magellan mission were to map the surface of Venus with a synthetic aperture radar (SAR) and to determine the topographic relief of the planet. At the completion of radar mapping 98% of the surface was imaged at resolutions better than 100 meters, and many areas were imaged multiple times. Other studies included measurements of surface altitude using radar altimetry and measurements of the planet's gravitational field using precision radio tracking. The mission was divided into "cycles," each cycle lasting 243 days (the time taken for Venus to rotate once under Magellan's orbit).